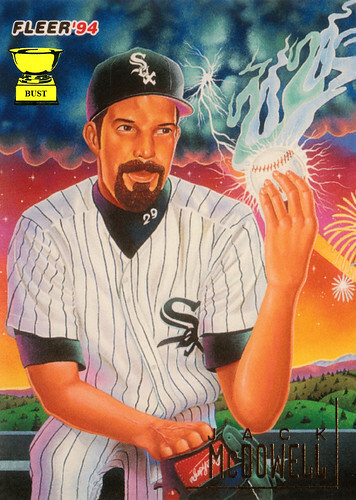 Our interpretation of another masterpiece by the folks at Fleer: OK, so the weird miniature lightning striking the baseball obviously is representative of McDowell's electric stuff. And the smoke coming off the ball likely is indicative of what the artist was on while drawing this creation. We'll assume that the fireworks in the background are in honor of McDowell's 1993 A.L. Cy Young award. Shoot, we'll even venture that the strange twist in the front of his jersey represents his inner animal (presumably a ferret or weasel) trying to come out. But what the heck are those dramatic veins in his glove hand? Good lord, that's frightening.